Southwest Georgia Bank is a long time multi-facility client of CBI. The bank is based in the small farming town of Moultrie, GA, near the Florida border, and several years ago worked with CBI to develop a branch in the larger city of Valdosta, GA, to enter a much larger and growing market for the bank. The first branch was very successful and was followed by a branch south of town which has also been successful. With the growth the bank has experienced since entering this new market, they needed additional space for executive offices and commercial lenders. 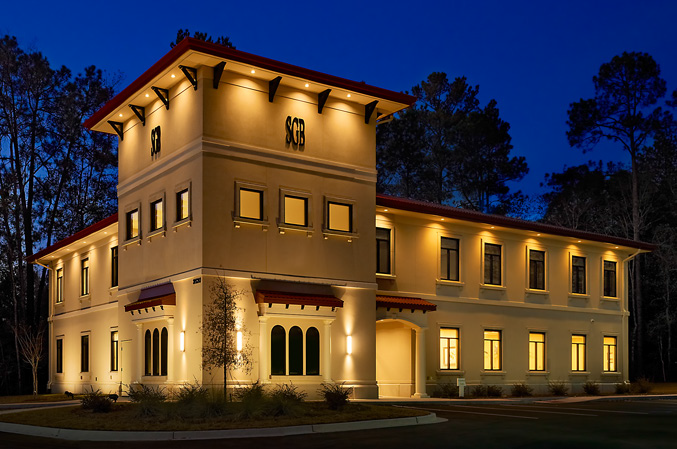 The new commercial Banking Center is adjacent to the original branch, which was designed in the Spanish Mission style to complement the look of Valdosta State University’s buildings nearby. The new building has a similar design inside and out. The Banking Center houses the City President and Commercial Lenders, as well as Executive Offices for frequent visitors from the Moultrie Main Office. The building also features a large multi-function room that can be set up for training, used for large meetings and also functions as a Community Room. Adjacent to this multi-function room is a large commercial kitchen. In addition to the features mentioned, there is room for future offices and cubicles as the bank continues to grow in the Valdosta market.